Garden centers sell liquid or powder rooting hormone, which allows the home gardener to grow new plants from another plant and creates an inexpensive way to add additional plants to the landscape. 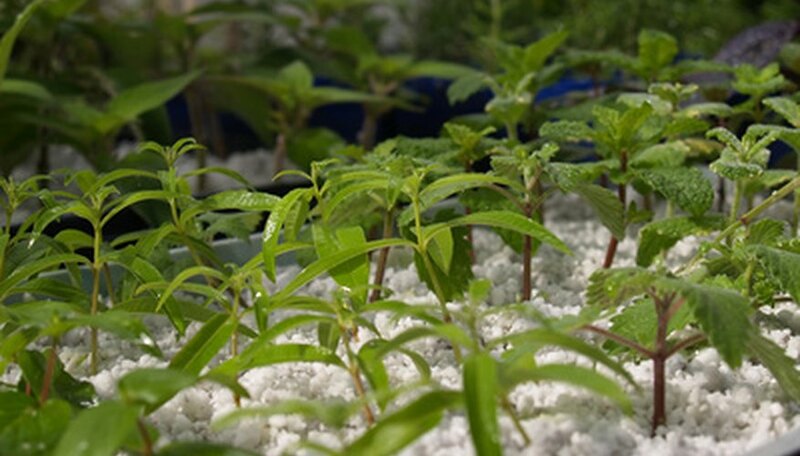 Many plants can be cloned through stem cuttings taken during the early part of the growing season when the stems bend easily, but do not break. Moisten the soil with warm water to a consistency of a damp sponge. Squeeze out any excess water with your hands before putting the potting soil into the growing tray. Level out the soil and create uniform holes for the plant cuttings. Choose healthy plants to propagate to keep the spread of disease or pest infestation to a minimum. Make several stem cuttings from the existing plant with pruning shears or a sharp knife, so there is no damage done. Make the cuttings 6 to 8 inches long with at least one leaf node at the bottom of the cutting and 1 leaf node an inch or two from the top of the cutting. Strip any flowers or leaves from the bottom 4 inches of the plant cutting by gripping the stem between your thumb and forefinger and sliding your hand down the stem. Snip off any flowers from the tips of the cuttings. Place the cuttings in water until you are ready to plant them into the growing tray. Pour 2 tbsp. of rooting hormone onto a paper plate. Dip each stem cutting into the rooting hormone and shake off any excess powder by gently tapping the cutting with your finger. Stick the cuttings into the holes of the soil in the growing tray. Gently tamp down the soil around each of the cuttings to remove any air pockets. Cover the growing tray with the plastic bag or plastic film and secure the plastic to create a miniature greenhouse effect for the stem cuttings. Place the growing tray in a bright location but out of direct sunlight. Monitor the growing tray every day to remove any dead or dying stem cuttings. If the soil becomes dry before the cuttings form roots, mist the soil sparingly with a spray bottle of water. Wait three weeks and gently tug on the stem cuttings. If you feel slight resistance, this means the cuttings are growing a root system. Remove the plastic and allow the cuttings to continue growing for another two weeks. Transplant the new plants into separate containers and condition the plants to the environment slowly by gradually introducing them to direct sunlight and a weekly watering schedule. Once acclimated, transplant the new plants to their permanent home in the garden. A leaf node is the slight bump on a stem where a leaf forms. Tamping down the soil after inserting the cuttings removes air pockets which could contain bacteria that attacks the stem cuttings, causing them to rot. Do not allow the soil to be saturated as this will cause the cuttings to rot and die instead of rooting. Avoid direct sunlight while the cuttings are under plastic or the heat generated by the sunlight will burn the cuttings and they will die.